A friendly holiday home in Florence, Tuscany, a vacation rental in Italy,only 4,5 km from Florence down town historical centre, with a very good bus connection during the week, not on Sunday and bank holidays. Easy access by car to all the attractions of Tuscany, the Siena Palio, Arezzo Gran Place, Chianti area and wineries. The house in the park is lovely, well furnished and comfortable with 2 nice bathrooms and 3 bedrooms on 150 m². From the living-room, which is a winter-garden, you look onto a relaxing green park which is shared only with the house of the owners and their two golden retrievers. Fully restored it meets all needs of northern European and American comfort with WIFI. Easy access to the city of Firenze offers the bus with stop is right in front of the park, in which is also a parking space for the guests and a football field (soccer). An extra Baby cot is available. In front and walking distance is a Restaurant-Pizzeria. The owner speaks English and German: The arrival and transfer down town is very simple and quick. The Bus nr. 41 arrives in 15 minutes from the centre, departure Piazza Ferrucci. From the train station one takes the Bus D to Piazza Ferrucci, every 10 minutes. The Busstop (fermata) is right in front of the park. It is anyway in a perfect position to make daily escursions to Siena, Arezzo and Pisa, even Venice and Rome are easy to reach with the high speed train. Florence City is overwhelming with Art and Architecture and coming back home to your cottage in the park is the relaxing part of your stay. Interested in art, travelling and my family, I like to share and have guests myself. Culture and a sophisticated lifestyle is what we all like without forgetting nature. Because it´s location is so ideal. 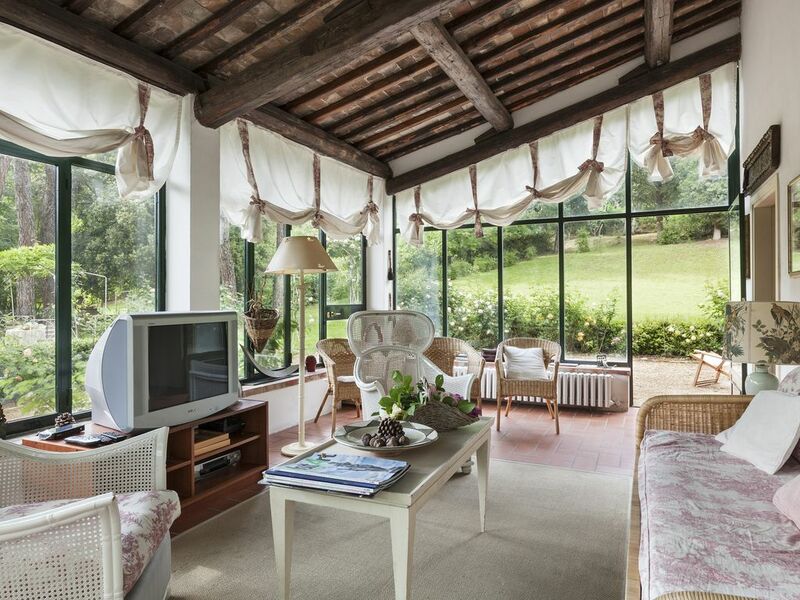 Close to the city centre and at the same time in the green nature of the Florentine Hills. We liked it because it has this second home and we like to have persons around us. Flowers, Roses and green around in a luminous wintergarden and house. It is like a own cottage and in a few minutes you are down town Florence. The bus service is perfect and also for daytrips it is a good pole position. Complete bath rooms , one with a shower, the other with a bath tub, toilet, single basin (sink) and bidet. Is available and will be calculated on your consumption. The dining area is directly in the habitable kitchen. Very close by, about 15 km is the Golfcourse of Ugolino. A cot is available on request and elderly persons should be able to get up the staircase onto the first floor, the bed rooms are all upstairs. Check In can be done Saturday or Sunday, due to family organization and work, we cannot be there during the week to welcome our guests. The children love to use the little soccer field in the park. Unfortunately we can not accept other dogs, as we have two very kind Labradors and want them to be calm and secure about their terrain. My family and friends were lucky to stay in this wonderful villa while visiting Italy. The hosts were gracious and the villa was beautiful. There was a family owned restaurant within a half block- the food was great and they treated us very well. Also, other supplies were readily available from a local co-op. thank you for your description and your valuation. We are happy if our guests are feeling fine and are at ease in a foreign country. Hope to have you back one day. The house was very comfortable, with extra blankets which were welcomed as it was quite cold for this time of year (September). Owner and cleaner were both very welcoming and accommodating. Bus connection (weekdays only) to Florence was very good, if a little hairy going down extremely narrow roads. Local shop and Pizzeria were both excellent. thank you for taking the time to write a review and it was nice, having you as guests. We are happy that you had a wonderful time and enjoyed your stay. It is a lovely house, tastefully decorated, but not so fragile that one would worry bringing children along. The hosts were exceedingly gracious and helpful. It was a great place from which to explore old Florence, as well as other places in Tuscany, such as Pisa (Leaning Tower, of course), Lucca (an intact city wall whose ramparts are now a beautiful park), Castigliocello (beautiful rocky beach, very Nantucket) and Forte dei Marmie (upscale beach, very East/South Hampton). It was great to come back from these trips and have a cool outdoor garden at our disposal. Although driving and directions are a bit tricky in Florence, it's worth figuring out. We were able to get to old Florence (i.e. Uffizi, etc. ), within 15-20 minutes. it was very nice, getting to know you and your lovely children and to see them playing with the dog in the garden! Thank you for taking the time to write a Review and we really hope to have you back again, all five of you! We have stayed in rental properties for several years and this was one of the best experiences we've ever had. The property and its location were both terrific. But by far the most wonderful part of the visit was the hospitality and kindness shown to us by the owner, Sylvia. From the moment we got there, she was a wealth of information not only about the property and the local environment (where to shop for groceries, etc), but about things that made it easy for us to enjoy Florence. Where to park in town, what restaurants to try, what museums were most worth seeing. She went out of her way to call and make reservations for us at restaurants. When we were taking a day trip out of town, she was incredibly helpful and generous with her time, advice, assistance and more. We could not be more grateful and could not have had a more wonderful host. The property was terrific as well: very clean, charming, with all we (family of 5) needed in terms of amenities. I recall reading some prior review of the property that complained about the walking distance to shopping, bus stops and restaurants. To be clear: you should have a car for this property. But if you do (as we did), it is fantastic. Just a 12 minute drive into Florence and all that wonderful town has to offer. In short, we'd HIGHLY recommend the property without reservation. I feel so lucky to have booked this absolutely lovely property. The home is as wonderful as the photos, and the hostess, Sylvie, was the most gracious person we could ever have met. Sylvie lives in a separate house on the property and has staff around during the day so there is always someone to answer your questions or help you with anything you need. Everyone is kind and helpful. The property is wooded with a small vineyard and an adjacent olive grove. I would have been happy to have stayed here and never left the property. The house has two large bedrooms upstair with large en-suite bathrooms.There is also one small bedroom with a single bed. There is a powder room downstairs. In the kitchen the cooking area was a little small for three women but it was cozy and worked well. There is a washing machine but no dryer. There is a clothes line in the yard and an inside clothes rack. We rented a car in Venice and drove to Florence (easy drive). We used this house as a base and drove all over Tuscany. It is within an hour drive of just about anywhere you want to go in Tuscany. When we wanted to go into Florence (no one wants to drive in the city of Florence) we just walked down the lane, out the gates and down the road about 10 minutes to the bus stop. When we came home after a long, tiring day in the city we just took a taxi back from the city. The cost of the taxi from the Ponte Vecchio is about €12. There is a small grocery store down the street, the proprietor and staff are the kindest people and, if you like, they even have some wonderful prepared foods you can just take home and heat up (fresh pasta, meatballs, pesto, etc.) They also have a full bar and you can purchase bottles of liquor and wine to take home. There is a restaurant across the street from the house, I do recommend their pizza but we were disappointed with other dishes on the menu. It is not a small, quiet place either, it seems to be a favorite place for families. When we were in Italy our homes in Florida were under siege by a category 4 hurricane and we were very anxious about the storm. Sylvie gave us access to her living room and television all night long as we could not get our television to work, we would come and go every few hours to see what was happening. Sylvie even served us refreshments while we followed the storm, and in the morning Anna made tea for us. We felt like honored guests. We sent photos to some family members and they are booking the house next year. Best thought of as a base for exploring the area. The accommodation is very convenient for the E35 motorway with travel times to the following – Florence 10min, Lucca 1hr, Pisa 1hr15min, Bologna 1hr15m, Rome 2hr25min. The house is situated on the North side of a small valley, the main Bologna-Rome motorway is about 400m to the south, you get some traffic noise in the garden. You can find the location of the house on Google Maps easily as it is directly opposite the Casale de Rici restaurant on the Via della Cinque Vie near where the SP127 road joins the main E35. I’d describe the kitchen as equipped to a fairly basic level by UK standards, the two bigger bedrooms have an air conditioning unit. Whilst the accommodation is described as an independent house it is in fact only part of a house & there is another occupant in the other part of the building. The trees in the garden outside the sunroom provide good shade from the heat of the sun but bring strong insect repellant to ward off the mosquitos. The Via della Cinque Vie is not a busy road but it does connect several villages & has a steady amount of traffic, there are no pavements so it is not the sort of road you would go for a stroll on. The bus service stops outside the gate but only goes south of the river Arno in Florence so you need to catch a second bus to get into the center. The buses don’t run late at night & as most restaurants don’t open until 7pm you will need to drive or get a taxi. Florence has a restricted car zone with a 100 euro fine (ZTL) so if you are driving to park make sure you know the limits. Parking is 13euros for 5 hours. Florence itself is situated in geographic bowl, the temperature in Jul/Aug is in around 34c (mid 90s F) by the afternoon & the heat is quite oppressive. We ate in a variety of restaurants & for 4 person meal, 1 course, 1 drink, 1 coffee I’d count on approx 80 Euros. The owners speak very good English & were very helpful. thank you for taking the time to write a factually correct and detailed review, which we take as an input to change what we can to improve the stay for our future guests. First of all, I have changed the "independent" house and Silvia will update the kitchen this year for the coming season. Sometimes the wind brings the noise over the hill from the motorway but it depends on the direction and it is quite a humming one, there is not much we can do. Have a nice time and we hope to have you back again. This cottage is situated only 4,5 km from the centre of town from where it is easy to reach in the famous Florentine Hills, the exclusive living in Florence, . It offers quietness and green around which is shared with the mainhome of the owner within the park. Also the next golf course of Ugolino Golf is only 15 minutes away. A good Pizzeria and the bus stop are in front of the own park where you have naturally your own parking place for the car. The bus brings you frequently into town and back.For rides into the wonderful Chianti area you need just five minutes to get onto the highway A1 and from there everywhere in Tuscany. Distance to the airport of Florence Peretola is about 20 minutes drive on the highway, about 40 minutes through the city. From Pisa airport it will take you about 1 hour and 20 minutes drive. All these indications are approximately as depending on the traffic and time of the day.Enjoy relaxing green after a day of culture and architecture. Golf: Golf Club of Ugolino is the one of the most important Golf club's in Tuscany with beautiful scenery and at the same time close to Florence city centre. The lovely house is half way to each direction. Ski: To the Abetone Skiing area it is a 2 hour drive and very beautiful. The down payment is a reservation fee of 25% and not refundable. Consumption of water, gas (for the hot water) and electricity is included. Heating is always to be paid for as an extra and based on consumption. The final cleaning is 90 Euro. There is a cot for babies.